Adorns the pride of place at Nadakkavu, 'PVS Navaratna' is designed to satiate even the most discerning customer. 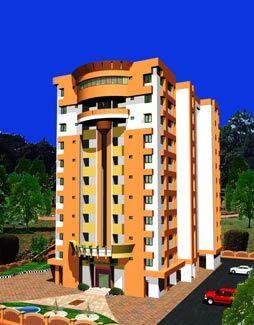 This 11 storeyed apartment complex consists of 60 flats with 2 & 3 Bedroom apartments. When it comes to the facilites, 'PVS Navaratna' boasts of a health club, children's play area, 2 passenger lifts and an enormous parking area built to facilitate a large number of vehicles. The locale has been chosen carefully since it's one of the best residential areas in Calicut. But what makes the choice so unique is the other aspects of supreme convenience. Besides being situated in a tranquil area PVS Navaratna is close to a number of educational institutions, hospitals, super markets, places of worship and so on. All it means is that, all you need is just a few steps away. 'PVS Navaratna', is sure your ideal home, if your primary concerns are quality, accessibility and maximum value for your hard earned money.